Submitted by Norm Roulet on Wed, 05/30/2007 - 22:24. Enlightened through insight from the 18th annual Harvey Buchanan Lecture in Art History and the Humanities, by Chinese art historian Wu Hung, I realize what is absent strongly defines our art, culture and community here in NEO today, in a very different way than what is present, and that is fascinating and disturbing on many levels. Professor Hung presented examples in Chinese art and culture where the absence of presence and image were core to the meaning or substance of a work of art or cultural interpretation. 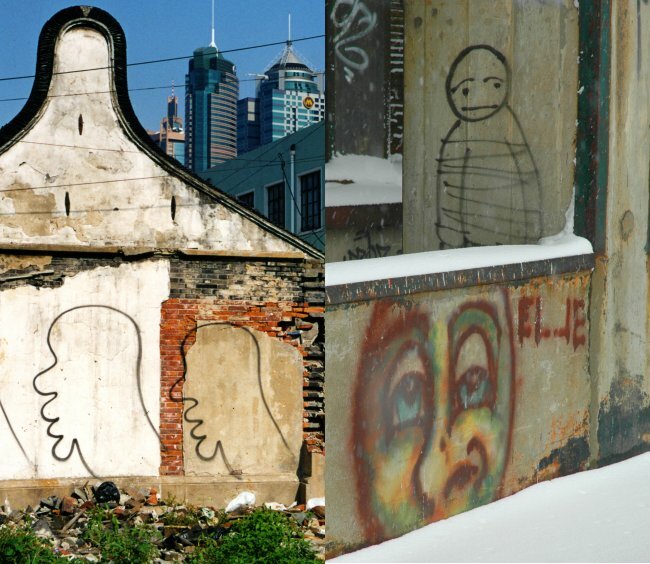 He illustrated his point by showing images from ancient tombs, representational art, mirrors, and pillows, and featuring the contemporary work of Chinese artist Zhang Dali, who gained attention in China and worldwide for posting over 2,000 graffiti likenesses of himself on walls around Beijing, China, in a self-present yet absent conversation with the city. Dali's flat, painted exploration in presence led him to three dimensional interpretation of absence, through carefully execution of his trademark form as cut-outs in walls, framing "progress" through the context of related destruction - the walls Dali was destroying were already destroyed by society - which led to a deeper discussion within his community through viewing negative space within destruction, highlighting contemporary cultural conflicts and voids in China. In the end, Dali's "graffiti" was meant to be a temporary statement, which the artist photographed for the longer conversation we continue here today. And, we have similar conversations happening in NEO today, where certain forces of "progress" seek to create a new presence of their choice, in the process creating an absence for others. Is what is present or absent more important? From an article at Chinese Contemporary, there is a quote that "Zhang Dali's intention throughout his body of work is to call attention to the changes taking place in Chinese society primarily due to the destruction of long standing communities." Living in Cleveland, where the absence of long standing communities is perhaps the most powerful visual and social reality, it is exciting to see and appreciate correlations and conflicts between art and life - artists and establishment - happening in China and in NEO, expressed in bold and challenging ways. An excellent example is the site in the flats where the Ohio Department of Transportation (ODOT) wants to place a freeway bridge, creating a poor presence in an important vista, where the absence of poor architecture, unnecessary mass and unsightly obstructions is important. What should be present here is nature, as a beautiful river valley, and people, as a beautiful place to be - that they are absent should be challenged by society, as the artist did above. 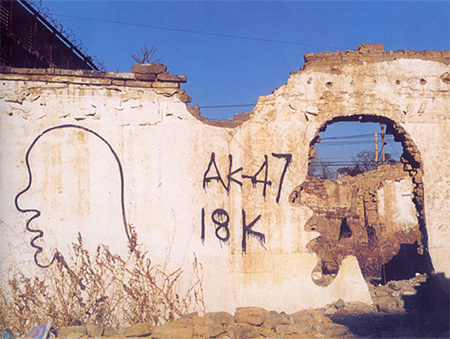 More on Zhang Dali's graffiti art, as AK47 and 18K here, from Beijing Scene.